» CIMA Exam Structure: How Many Papers are there in CIMA? 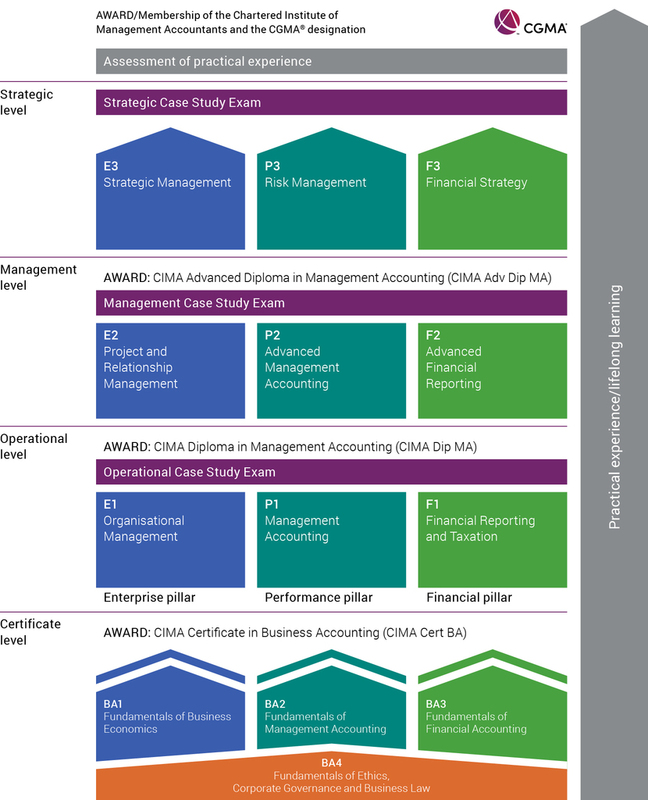 The CIMA exam structure adopts the typical UK approach, which is quite different from the US style that you will see in CPA, CMA and CIA. In order to take the CIMA Exam, candidates must either obtain the Certificate in Business Accounting from the CIMA, or they have a relevant master’s degree or equivalent accounting qualification. The CIMA Exam, formally known as the Professional Qualification, consists of the operational, management and strategic levels. In each level, there are 3 pillars: Enterprise pillar (E), Performance pillar (P) and Financial pillar (F). You can see the pillars as exam topics, covering organization management, management accounting and financial reporting respectively. You have to complete one level to move on to the next. This is a sequential exam. How Many Papers are there in CIMA? In each of the 3 levels, there are 3 objective tests, representing the 3 pillars. There is also one integrated case study in each level. This level covers the role of junior accountants — the implementation of strategy and related reporting. Candidates will learn how to prepare financial statements, provide management accounting information, and use appropriate tools to make business decisions. Once you complete this level, you obtain the CIMA Diploma in Management Accounting. This covers the role of managers — to be the bridge between senior management and staff, between strategy and implementation. The work focuses on monitoring and reporting. The candidates will learn how to prepare group accounts, make pricing and product decisions, and manage projects and relationships. Once you complete this level, you obtain the CIMA Advanced Diploma in Management Accounting. This level covers the role of senior management — the syllabus concentrates on making strategic decisions and providing the context for which those decisions will be implemented. Candidates learn how to formulate financial strategy, manage strategic relationships, and identify and manage risk. Upon completion of the Strategic level, candidates will be eligible to submit their practical experience for assessment. For those with a master’s degree in accounting or an MBA, you can choose the accelerated path by taking the CIMA Masters Gateway exam. If passed, you can skip the first two levels and go straight to the Strategic level. The CIMA Masters Gateway Exam has the lowest pass rate among all CIMA tests. One must put in the effort in order to take advantage of this fast track. The candidates can take the Objective Test in each level in any order, but they have to pass all 3 before taking the Case Study exam in that level. The Objective Tests have a distinct syllabus based on the level and learning pillar. Each test is 90 minutes long and comprises multiple choice questions. In contrast to the Objective Tests, the Case Study exams combine the knowledge and learning across the 3 learning pillars, and are set within a simulated business context related to 1-2 fictional organizations (but based on real business scenarios). Each case study exam is 3 hours long. Candidates are required to provide short answers and essays. When can you take the CIMA exam?